Preheat oven to 350 degrees and lightly grease a regular square or round cake pan. In medium bowl, sift or whisk together the flours and the cocoa. Add baking soda, baking powder, xanthan gum, and salt. Whisk until well combined. Put potatoes in a small bowl. Microwave on half power for 1 minute if they are cold. Add warm water and stir until well combined. Put butter, sugar and vanilla in the bowl of an electric mixer. Mix on medium until light and fluffy (about 4 minutes). Add the eggs, one at a time, scraping down the sides of the bowl as needed. Mix until well blended. On low speed, alternate adding the potatoes and dry ingredients to the butter mixture. Mix until well incorporated. Fold in chips or nuts if using. Place batter in your cake pan. It will be quite thick – almost like icing. TIP: The batter does not self-level so you need to smooth over the top with a spatula or icing spreader if you want a nice flat cake. Bake in oven until cake springs back when lightly touched and begins to pull away from the sides of the pan. About 20 – 25 minutes. Remove from oven and place on rack to cool. TIP: Like Geoff, this cake gets better with age. Once cool, cover with plastic wrap and leave on the counter overnight. The cake will become moister and the flavours of the cocoa and the coconut will intensify. TIP: Serve with gluten free ice cream as shown or ice with Nutella Cream Cheese icing. 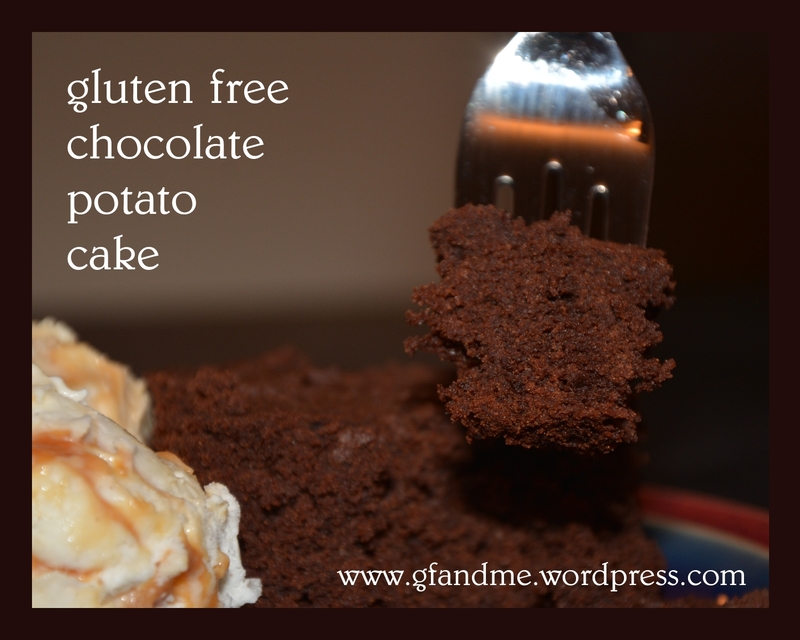 This entry was posted in Baking, Recipes and tagged Cake, celiac, coconut flour, coeliac, fluffy, GF, gluten free, gluten free in Red Deer, mashed potatoes, nutella, recipe. Bookmark the permalink. I’m trying this recipe! The Nutella cream cheese icing sounds delicious! It really, really is. Let us know what you think! Wow! By the way, I love the background picture on your blog! Looks good! Thanks! The painting is Camille Pissaro’s “Landscape at Pontoise” (1874). Looks like a delicious way to use up leftover mash! That sounds really good. 🙂 I wish I could bake with coconut flour but we have a coconut allergy in our house. I’ve used mashed potatoes in bread before and it makes it moist I bet it’s even better in cake. I’m sure you could replace the coconut flour with more rice flour or maybe almond flour (if that’s tolerable) or even potato flour. I just used coconut to add a little tropical flavour. I wonder could you use a GF all purpose mix here? I’m sure you could – my go to flour mix is usually some combination of rice flour cut with something lighter like tapioca or corn starch. The coconut is there mostly for flavour. You just may have to add a bit more (or less) water depending on your mix. As I said in the post, the batter should be quite thick. Good luck! And please let me know if it works out. I just got the Bobs red mills mix the other day, as it’s hard to come by the other flours where I live. I’m not strictly GF myself but do avoid when I can and also as part of my job I like to try recipes for clients who are GF. I will definitely try this next time I have mash and will let you know! Wow! I don’t like mashed potatoes because I’m texture sensitive but I actually might give these a go!